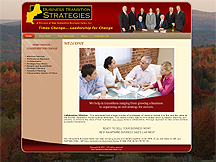 Barrington Editions LLC recently had PCS Web Design revamp their website. Their prior web developer had moved out of the area and although their relationship was amicable, it was proving to be simply an issue of wanting to work with a local resource. Jim Fontaine, owner of PCS Web Design, was more than happy to step in and work with John Cooke of Barrington Editions on their website redesign. 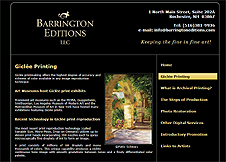 Barrington Editions LLC provides high-quality digital imaging services and fine art reproductions to a wide variety of clientele. The redesign was focused on maintaining the existing look-and-feel while addressing minor architectural and layout issues that had crept into their website over time. 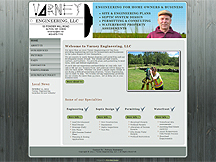 Varney Engineering LLC hired PCS Web Design to redesign their website. Jim Fontaine, Internet Architect and the owner of PCS Web Design, met with Tom and LuAnne Varney several times during their website redesign project. 2011 marks 35 years and counting of providing professional engineering services to the Lakes Region of New Hampshire by this family owned and operated business with strong ties to the local community. The redesign was focused on developing an online presence that resonated with the family while clearly communicating the breadth and depth of services that their company offers. The owners are very pleased with the results and are looking forward to what their long-time clients have to say. 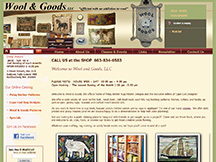 Wool and Goods, LLC's new website is ready to take orders at www.woolandgoods.com. Wool and Goods hired PCS Web Design to resurrect the owners' dream of having an e-commerce website. After several frustrating attempts at having an e-commerce website built for their unique product line, owners Rae and Kathy sat down with Jim Fontaine, the owner of PCS Web Design, and began the process of re-envisioning what they wanted. PCS Web Design's experience with delivering e-commerce enabled websites was able to turn their dream into a reality. Not only does Wool and Goods' new website provide the e-commerce capabilities the owners were looking for -- but, it also allows them to maintain and manage every aspect of their website's content, inventory, and online sales. Onsite training and ongoing support during the launch of their new website alleviated much of the stress that surrounded their previous attempts. Feedback from some of their best clients has been overwhelmingly positive. "It's always a pleasure to help business owners directly when they've experienced less-than-ideal service prior to working with PCS Web Design." states Jim Fontaine, PCS Web Design's owner and Internet Architect. 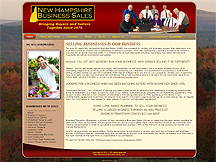 New Hampshire Business Sales (NHBS) is pleased to announce the launch of their newly redesigned website at www.nhbizsales.com Jim Fontaine, owner and Internet Architect at PCS Web Design, worked directly with the owners of NHBS, Leon Parker and Ivor Thomas, as well as Melanie Heinis, their Operations Manager, to address technology concerns surrounding the development and launch of their new CMS-enabled website. Ease of use, for both their site visitors as well as their staff, was a top concern. Multiple design iterations to fine-tune the navigation and presentation layers payed off with a clean, easy-to-navigate site design that retained enough of their existing marketing and branding to be clearly identified with the firm. Data, content, and features migration was another area where PCS Web Design was able to use its expertise to reduce the perceived stress of moving to a CMS-enabled website. PCS Web Design was able to integrate key functions of their normal day-to-day operations (listings and forms management, blogging) directly into their CMS-enabled website. Onsite training and remote support sessions have eased the transition into working with their new CMS system as well.